While grocery shopping at Jewel, my nose detected a known, but distant, fragrance. Here’s what I looked down to find, and took a big, deep breath (yes, I inhaled!). 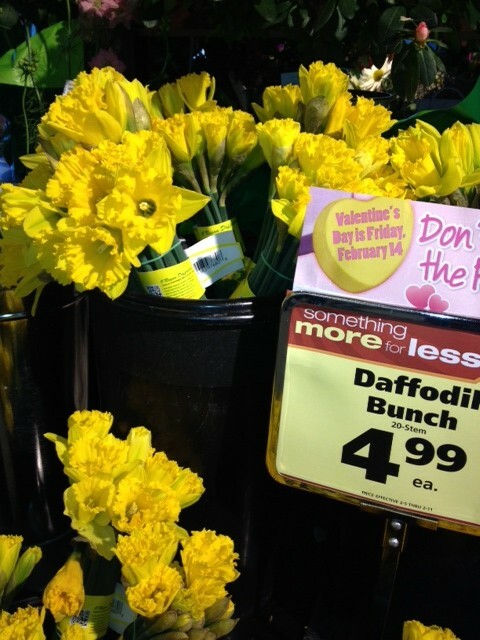 On this gloomy, snowy, boring day, may these daffodils bring you hope that spring could actually arrive this year! You are absolutely correct about the pleasant thoughts that daffodils bring. I am a real fan of flower-herb scents and over the years have become a fan of home crafted soaps using natural scents, honey, and organic oils. Read a very inspirational book titled “THE ESSENTIAL HERBAL FOR NATURAL HEALTH- by Holly Bellebuono with recipes for home crafted , soaps, lotions, poltices, and teas. Lately, I have been hooked on soaps fro “Sleepy Moon Soaps” at Baily Farm in North Franklin, CT. Had the fortune to buy some at a local farm stand down the street that distributes soaps for Baily Farm. The scents from these soaps sooth the mind and body..Interesting how certain smells connect directly to our memories- in a way that is similar to music. Am sounding like Marcel Proust, Continue looking for the beauty in each day Thanks for your Weedpatch posts..